Planning to install a new fence? If you want to select the best fence possible, you will need to debate the pros and cons of fencing materials like aluminum, vinyl, wood, steel, wrought iron, and chain-link. Some of these options are affordable, some are durable, some are easy to install, and some are versatile and beautiful. However, they each come with drawbacks as well: high costs, a tendency to rust, lack of style, frequent and frustrating maintenance . . . So before you make your final decision, be sure to consider all of the pros and cons of fencing materials. We would be happy to help you with your homework. Pros: Aluminum fencing is versatile, affordable, and durable. Plus, it requires very little maintenance. You can easily install it yourself, but if you choose to have professionals handle the job, the cost won’t be extravagant. Aluminum fences work well on sloped landscapes, and they come in a variety of stylish designs and colors. To learn more about the benefits of aluminum fencing, click here. Cons: Aluminum costs more than wood upfront, but because of the lack of maintenance, it will cost less in the long run. Though not as strong as steel, as you might have guessed, aluminum fencing will stand up to most environments. Finally, it won’t work well as a privacy fence, so if you want to block out your neighbors, try vinyl instead. Pros: Vinyl fencing is sold in a wide range of styles at affordable prices. It is also durable and strong, so you won’t have to worry about it warping, rotting, or blistering. If you enjoy home renovation projects, feel free to tackle the installation of your vinyl fence on your own. Most vinyl fencing systems snap together in lightweight pieces, making installation a breeze. Plus, many vinyl systems contain an interior of aluminum for durability and strength. To learn more about the benefits of vinyl fencing, click here. Cons: No fencing material is perfect, so despite vinyl’s many benefits, we must acknowledge its limitations and downsides. Vinyl, like aluminum, has a higher upfront cost. However, the lack of maintenance should make up for that over the years. In addition, it lacks the formidable strength of some other fencing materials, and it can turn brittle and crack in extreme temperatures. Pros: Wood is a historical favorite. It is attractive and usually inexpensive. Plus, it’s very versatile, coming in many different designs and styles. It works well for privacy fences, and you can paint it any color you like (or simply stain it). Cons: Wood requires a lot of maintenance, and that maintenance can be exhausting and expensive. You will probably have to regularly treat or stain it for added protection. Weather takes its toll on wood fencing, and you may notice rotting or warping due to excess moisture. Finally, and unfortunately, termites and other pests adore wood just as much as humans, which can lead to destructive infestations. Pros: You can’t deny the strength of steel. Powerful, heavy, and long lasting, it can act as a protective barrier like a security gate. You can rack steel fencing to suit uneven or sloped land, and most steel fences are galvanized and covered in a powder coating to prevent rusting. Cons: Steel tends to be quite expensive, and it lacks versatility. 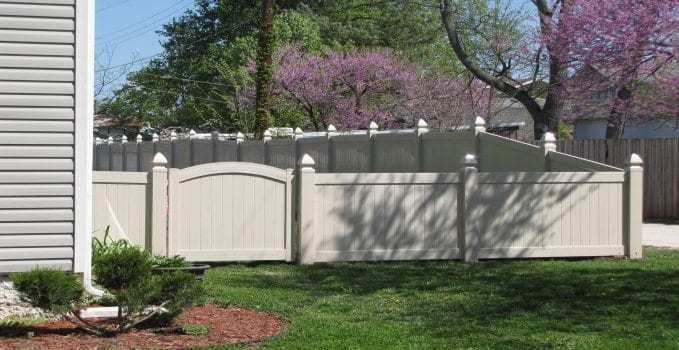 For example, you can’t use it as a privacy fence because its panels lack the needed coverage. Due to its weight, we don’t recommend that amateurs attempt to install it. In fact, some professionals view steel as entirely impractical for residential and family use. They only recommend using it on industrial premises. Pros: Wrought iron is known for its beauty and durability. It requires little maintenance and works well for creative, decorative designs. Due to its extreme strength and resilience, you can expect wrought iron to last for many years to come. Tremendously hard to break, it makes an excellent security fence for those seeking a high level of protection. Unlike wood, it won’t rot, warp, deteriorate, dry out, or become home to termites. Finally, many people appreciate the patina that develops on wrought iron over time due to oxidation. Cons: Heavy and difficult to handle, wrought iron fencing can be arduous to install. Looking at the pros and cons of fencing materials, you’ll also find that wrought iron is your most expensive option. Depending on your climate and location (damp environments are particularly susceptible), a wrought iron fence can develop rust spots. These typically arise in areas where the paint is scratched or chipped, so we recommend that you inspect, sand, and repaint damaged areas promptly if you don’t like the patina. Pros: Chain-link fencing is inexpensive, durable, and typically maintenance-free. It is also easy to install. If you take a look around your community, you will likely spot chain-link fencing everywhere, mostly due to its affordability. As a consequence of galvanization (a chemical process to prevent rusting), chain-link fencing lasts a long time with limited maintenance. Some people appreciate its flexibility as well. Cons: Chain-link fences are very utilitarian in appearance: no-frills, basic, pedestrian, and rugged. Many people would describe chain-link fences as boring, and some might go so far as to deem them unattractive. Since chain-link fencing is commonly used at industrial sites or in utilitarian applications (schoolyards, prisons, surrounding electrical enclosures), it isn’t very popular amongst stylish homeowners. People can easily climb over residential chain-link fences as well, so they don’t provide much protection. Finally, they won’t deter prying eyes unless you add slats, so you shouldn’t utilize them for privacy fencing. Now that you’ve done your research and investigated the pros and cons of fencing materials, you should feel more confident moving forward with the purchase of your new fence. Once you figure out your priorities and determine your budget and style preferences, choosing the material for your new fence should be simple. We recommend vinyl and aluminum – strong, long-lasting, and beautiful fencing materials that require virtually no maintenance. If you’re looking to add a new vinyl or aluminum fence to your property, be sure to check out MMC Fencing & Railing. To learn more about our premium fencing systems, browse through the MMC Fencing & Railing online store or give us a call at 1-866-931-5002.